The Winter Appeal: Final Results! So many of the homeless people and families will be kept warm this winter thanks to all those who have donated to our Winter Appeal, your generosity will make a big difference to many lives this Winter. A special thank you to all the people from our Wiseberry offices for all the hard work you have put in the past month, we simply couldn’t have done it without your support and partnership. Very proud of our Wiseberry offices for raising a total of 214 bags of goods weighing in at 1,523kg to donate to the over 19 shelters/organisations. Only half way through our Winter Appeal and very proud of our Wiseberry offices for donating a total of 38 bags, weighing in at 379kg so far! A huge thank you to all those who have donated, with your help we are able to keep these people warm during the cold Winter months. If you haven’t already, and would like to help towards our Winter Appeal, please find your nearest office from the link below to donate. Only 3 days into our Winter Appeal and the first box has already been filled! A special thank you to Wiseberry Taree and all who have donated so far. Let’s keep the donations rolling in to help bring warmth to as many people as possible this winter. There are over 116,000 homeless people in Australia. Some of these people live within our community and will not be sleeping in a warm bed tonight! In June 2018, Wiseberry offices are seeking donations to help their local shelters cope with the cold winter months. They are seeking donations in the form of clean blankets, new socks and jumpers. If you have any of these items to give away, please visit www.wiseberry.com.au/offices to find your nearest office and drop them off. Any help will be greatly appreciated and will go a long way to make a difference. Wiseberry Foundation Charity Night | August 2017 – Thank You! When we come together as one for a common cause, we create magic! Thank you to our numerous volunteers, representatives, committee members and people within the Wiseberry network for working so tirelessly over the past many weeks. Thank you to our many sponsors for donating so generously towards our cause, we simply couldn’t have done this without your support. And of course thank you to the many who came along on the night, to help, to work, to support, to enjoy because they care. Together, we have raised an astonishing $112,205! Wiseberry stands for more than real estate transactions. We believe that we are part of a community in a greater sense than business and care for those who might need a little extra attention. We truly live by our motto “Different in the way we care”! Our culture places considerable importance on the need to care for our communities and to ‘give back’. It is this culture that lead to the formation of the Wiseberry Foundation, a not-for-profit organisation that raises money via organised events to assist people within our communities with special needs. We endorse the belief that to be grateful means to help the people around us, starting from within our communities. We have seen first-hand how the smallest act of kindness can make the largest difference in someone’s life. In line with our belief that we should care for our communities, we have identified four families who could do with a little help. 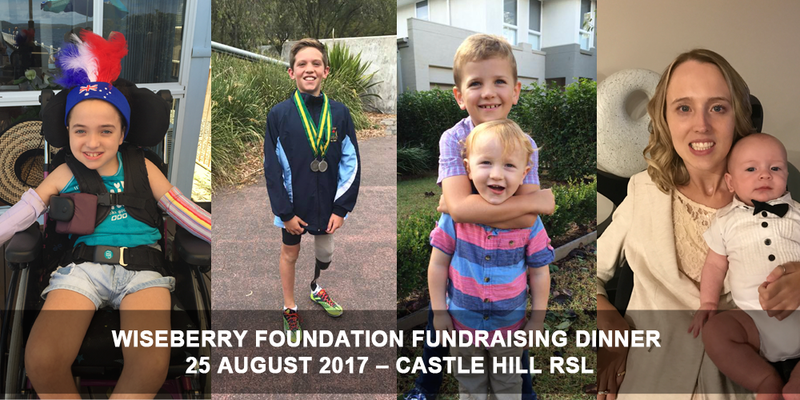 As such, we are holding a charity dinner on the 25th August 2017 at the Castle Hill RSL. Our dinner is about raising funds for Bobbi Jo, Tristan, Nicole & Reagan, Hank & Billy. For more information and to purchase tickets for the event, please click here.